Frank’s Bar, the short name for La Bodega d’en Frank Peterssein (named after a previous owner), is a fantastic old school Bodega – a combined wine bar and grocery store, once the back bone of the community, where one would go for bottled water, potatoes, cheese, ham, wine, beer, etc. 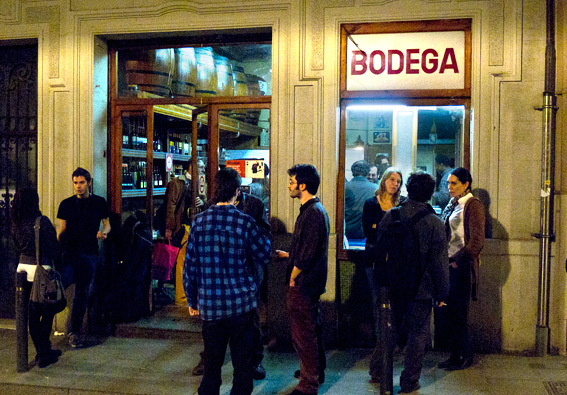 Bodegas are also places for drinking and buying wine from the barrel to take home. Sadly these wonderful bars with ancient decor are becoming a thing of the past. I’m not sure that Frank’s Bar still sells shopping and the barrels look to be out of commission, but the interior is otherwise unspoilt. It reminds me of the wonderful Bodega on the corner of my old street (C/ Milans), which, to my disappointment, has made way for a hairdressers shop. Frank’s Bar, notably, sells its own brand of Vermouth (a drink which is making a big comeback in Barcelona) and Estrella Galicia beer. Oddly they only sell red or white wine, though it’s not the only bar which doesn’t sell Rosado (some bars and restaurants just don’t). Like most Spanish bars, Frank’s also sells bar food, such as Manchego (cheese), tortilla (Spanish omelette), bocadillos (sandwiches), etc. The atmosphere easily makes up for the lack of Rosado and apparently, if you order the Manchego, they’ll give you more than you can eat! 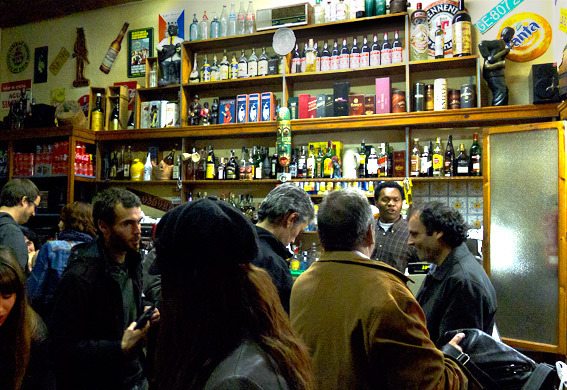 This entry was posted in Barcelona, Barcelona Bars and Restaurants, Drink, Eating Out, Food, Spanish and tagged Barcelona, bars, bocadillos, Bodega, Estrella Galicia, Frank's Bar, Manchego, rosado, tortilla, vermouth. Bookmark the permalink. Love places like this – we go to one in Granada which I can never remember the name of. We just call it The Vermouth Bar. They serve home made vermouth and the first tapa (which sounds dull but isn´t!) is always half a jacket potato, sprinkled with salt and drizzled with olive oil and eaten with a teaspoon. Big Man always eats his potatoes with a teaspoon, as do most Spaniards I know, which makes me laugh. And the silly man leaves the skin…. Odd that they don’t serve rosado, which goes so well with tapas, but i’m sure the own-brand vermouth more than makes up for it! Something did just occur to me though, tapas aren’t a Catalan thing – there are all sorts of new tapas bars in Barcelona now, but there weren’t many 20 years ago and before that. I don’t know if that makes a difference or not. I definitely wouldn’t call Frank’s Bar a tapas bar. Oddly though, some of the best rosado comes from Cataluña.